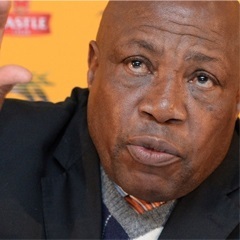 Cape Town - Bafana Bafana coach Shakes Mashaba believes Nigeria feel it will be payback time when they meet in an international friendly at the Mbombela Stadium this Sunday. The Super Eagles go into the game on the back of a 1-0 loss to Uganda in a midweek friendly, while South Africa beat Swaziland 3-1. But of more importance is the fact Bafana qualified for the 2015 African Cup of Nations earlier this year at the expense of the Nigerians, who finished third in the qualifying group, behind South Africa and Congo. It’s for this reason that Mashaba feels the West Africans will come out all guns blazing in Nelspruit. "Of course the Nigerians are still feeling bitter after knocking them out," said the tactician. "To them, it's payback time. Of course they still want to show us that they are still the best when comes to football in Africa." Mashaba admits that it will be difficult to plan for the game against a Super Eagles outfit that has made significant changes since the two sides last met in a 2-2 AFCON qualifying draw back in November 2014. "Like I always say, you challenge teams based on what you have seen in the past, but unfortunately when you get to this because it's a practice match, they don't bring what you expect," the coach continued. "But we are not going to believe that is going to be an easy game, it's going to be a tough match. We will definitely again put up a strong side in this game and our players must be prepared to compete." After 11 games between the two countries, Nigeria have only lost to South Africa on one occasion, with three matches, including the most recent, both ending in draws.